Holiday hosting... it really is one of my favourite things to do. This year I found myself straying away from the endless planning and all the little details. I love it but it gets so exhausting sometimes. Especially when the days just seem to sneak up on you. You end up running yourself ragged before the event has even started. I didn't want to let that happen this year for my annual girls Christmas party. I wanted to focus on the minimal, and let the conversation, feelings and true meaning of the night speak for itself. 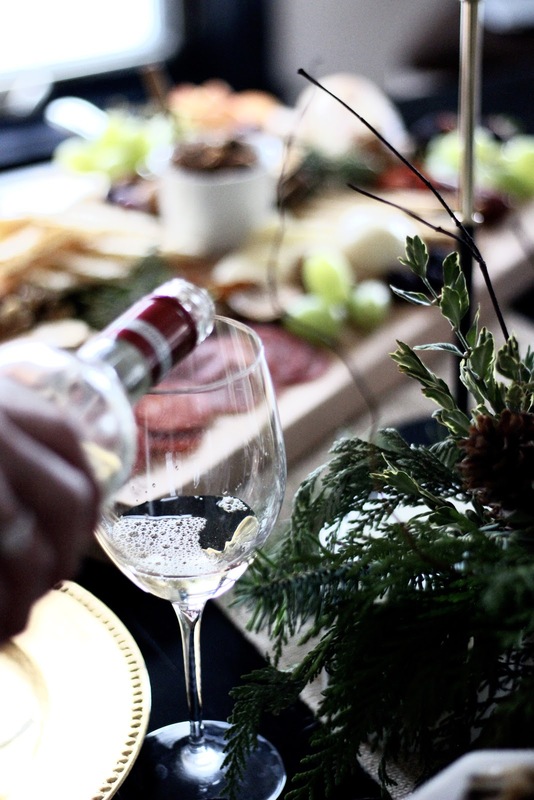 Holiday hosting doesn't have to be intimidating. This year I wanted to show how I cut the frills and fancy and focused on the simple and easy, while not comprising on style and taste! Just a few steps and you can do the same. In turn, you'll have tons more time for your loved ones and enjoy the moments leading up the get-together. 1. 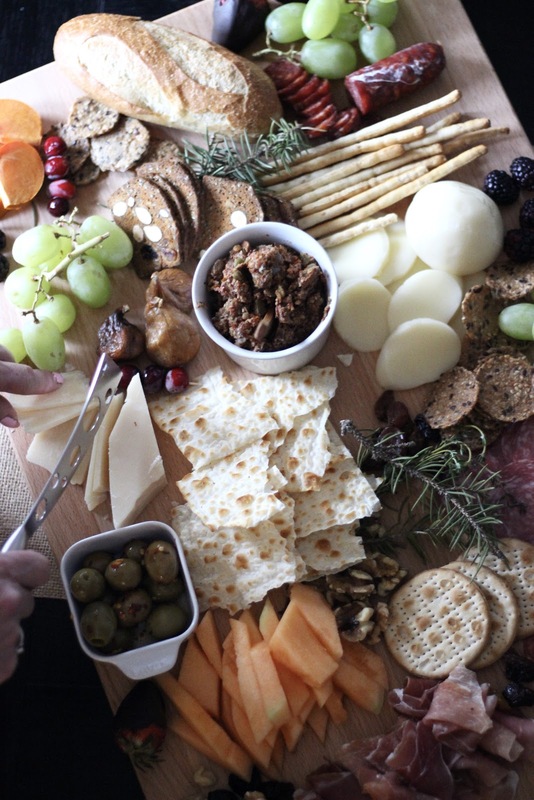 Skip the elaborate dinner and make a charcuterie board. They literally take 10 minutes to put together. I always ask B to run to the store and pick out his favourites since he is a cheese connoisseur. 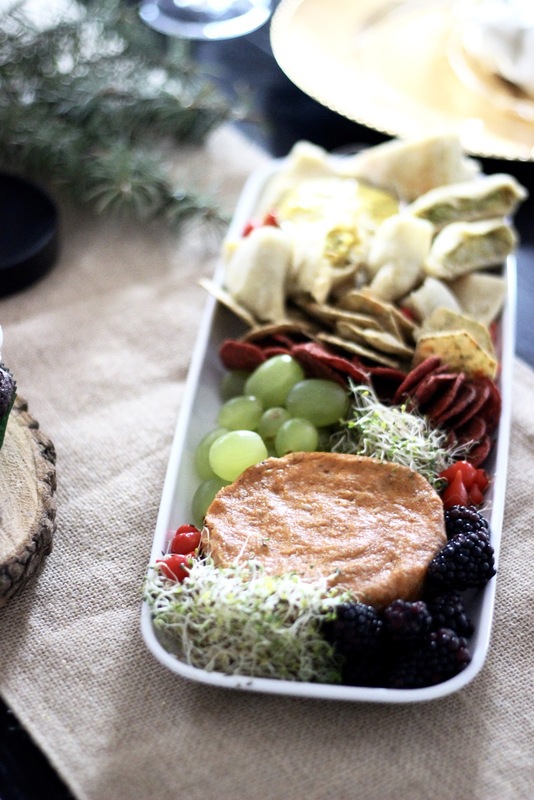 I focus on the little extras-- the crackers, the garnishes, the cute additions. You can put them together in no time whatsoever and they have such great impact, and there is something for everyone. Some veggies, a bit of fruit to mix up the flavours and some nuts to add a crunch. Remember sweet and savoury is key! I pulled out my massive cutting board from Zwilling and went to town, but you can use any size and make it your own! That's the beauty of them. There is no right or wrong way. Just make sure you have a proper cheese knife on hand! 2. Go minimal with the decor. I've done my fair share of the fancy themes... we've done glitzmas and rustic, but this year I went extremely minimal, and it made such an elegant impact. Some simple evergreens (literally cut off from the trees outside), a few candles and my classic gold chargers all came together beautifully. What helps, even more, to add to the decor is having great serving ware. 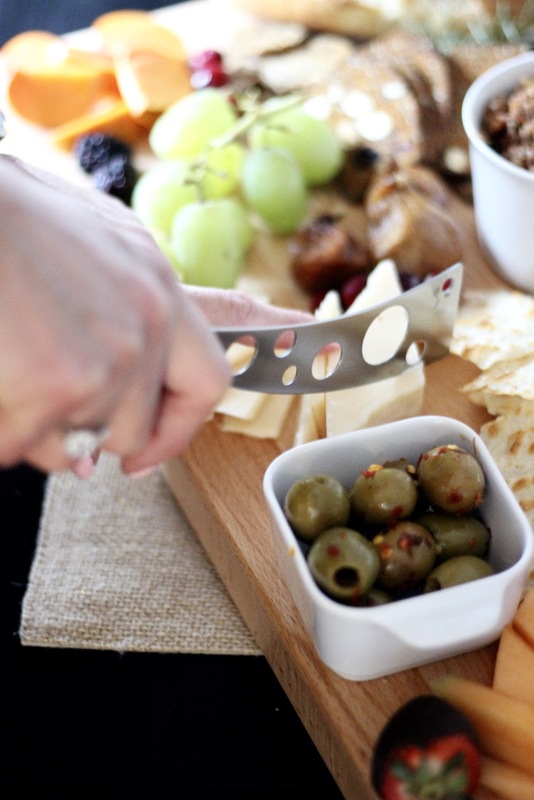 I love Zwilling for this; their styles are so timeless! I usually stick to white and clear and let the food speak for itself. 3. Pick up ready-made eats & treats. The biggest misconception people have is that you can't have quality and delicious food pre-made, or found at a reasonable price. There are so many local eateries that offer catering services that you don't need to stress out over making everything! 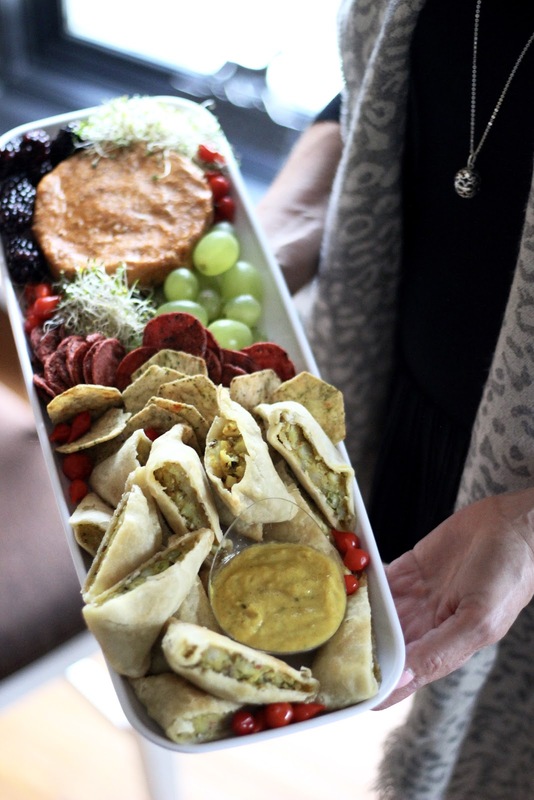 The Fix + Co put together some of their amazing platters for me that was indeed homemade and delicious. I love knowing that they use premium and local ingredients and that the food is plant-based and organic. They supplied us with an amazing vegan nut cheese (that actually tasted like pizza), vegetable samosas, and a delicious assortment of their sweets (raw balls, chocolate brownies and banana nut cookies). Speaking of treats!!! It would not be the holidays without a little something from Kelly's Bake Shoppe. Especially my favourite ginger molasses cookie. You guys... I can't even. I ate 3 in one day! They are so good. Everyone loves a treat from Kelly's and I love that they pride themselves on being the healthier bakery, offering vegan, gluten-free, egg-free, dairy-free and peanut free goodies! The Christmas menu is one of my faves of the year! 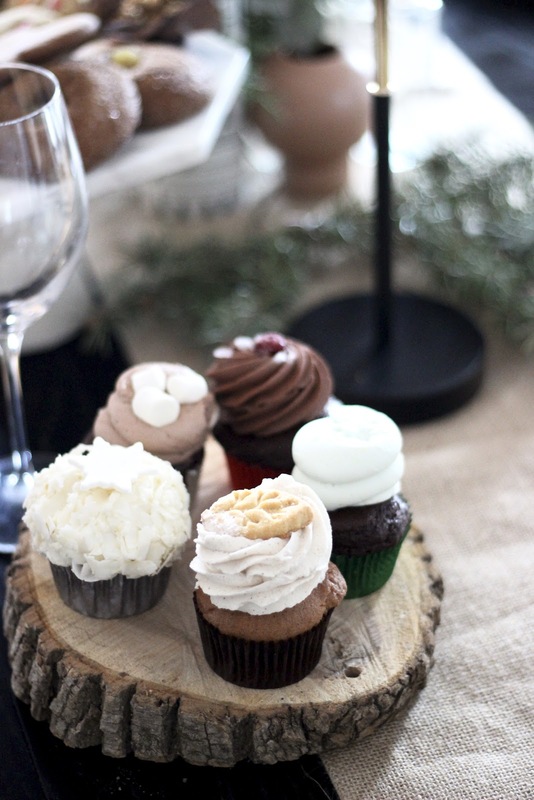 It consists of cupcakes such as pumpkin pie, hot cocoa, gingerbread and lemon, and other goodies like candy cane donuts, and double chocolate peppermint cookies. Mmm just thinking about them is making me want to stop everything I'm doing and place an order for delivery. Both places deliver making it even easier to host and offer quality food to your guests. No dishes required. 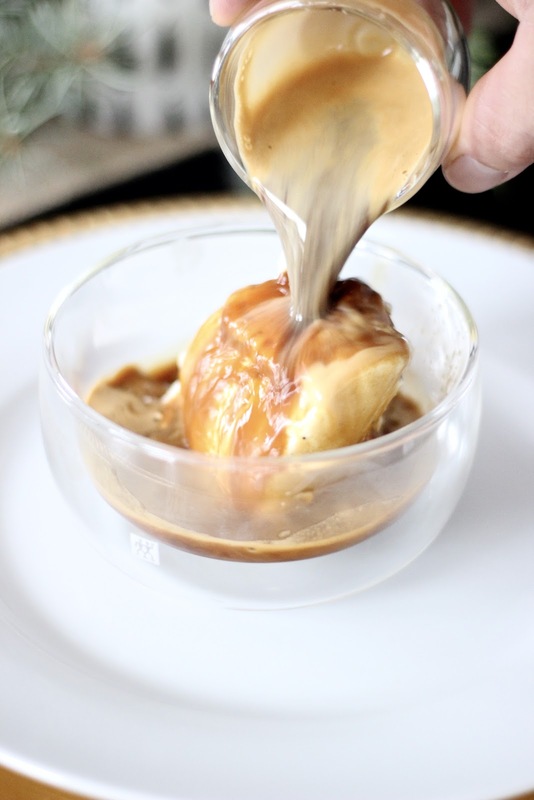 *If you want to wow your guests with an after dinner treat with a bit of a show, make an affogato! 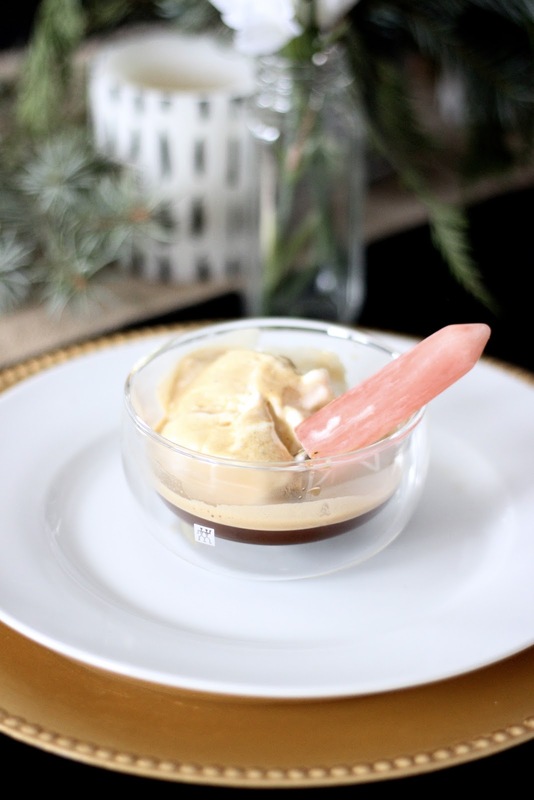 Scoop a couple scoops of vanilla bean ice cream into your glass dessert bowl and pour a shot of freshly made espresso over it. 4. Stick to one personalized touch. Don't go crazy trying to pull out all the stops, and this step is totally optional! 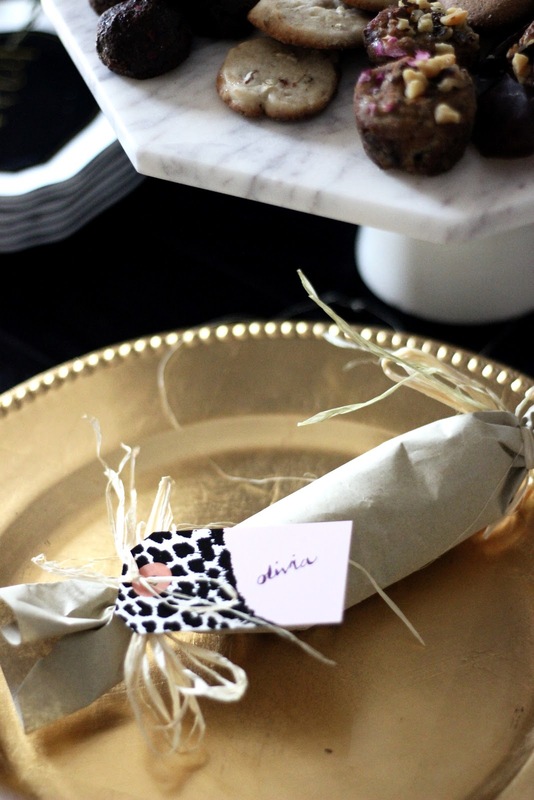 There are so many simple ways you can show your guests you appreciate them coming without going over the top. Sometimes I try to do too much-- name cards, favours, wine glass tags, etc. But no. This year I opted for something so simple and I thought it was the sweetest gesture! I made DIY Christmas crackers that doubled as seating cards for the table. I filled the inside with little goodies like candy canes, chocolates and lip sticks. You can find the whole tutorial in my newsletter (subscribe here). Does it get any simpler? 4 simple steps to make your hosting as effortless as possible, not to mention fun! After all, this is the holidays! B O N U S - - G I V E A W A Y ! To help make your hosting even easier I'm teaming up with Zwilling to giveaway this amazing cutting board and cheese knife (valued at $205)! You guys-- they are such statement pieces and so functional! 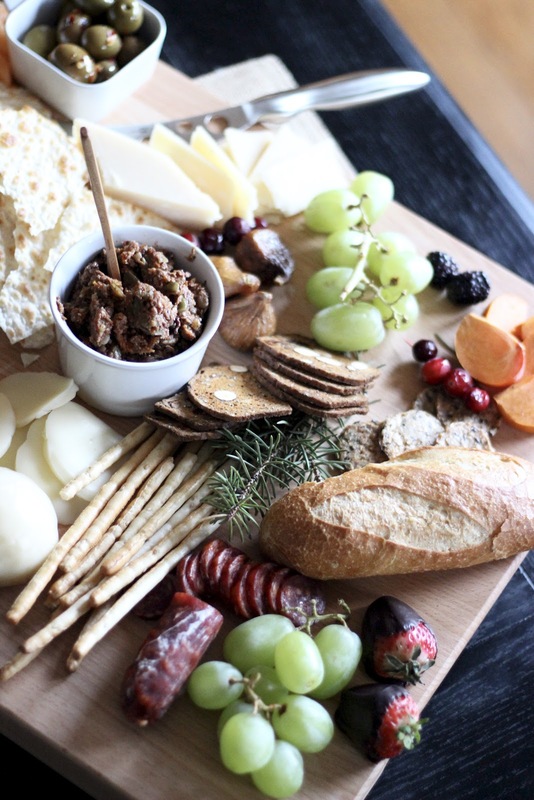 The board can be used for just about anything (meat, cheese, fruit, veggies), and the knife is so key-- it offers 3 different blade shapes to cut. What are you waiting for? Get your entries in below! BTW-- There is a bonus entry in today's newsletter! Look out for it! Contest is only open to Canadian residents. Will close on 12/17/17 at 12 AM. Winner will receive prize in January. 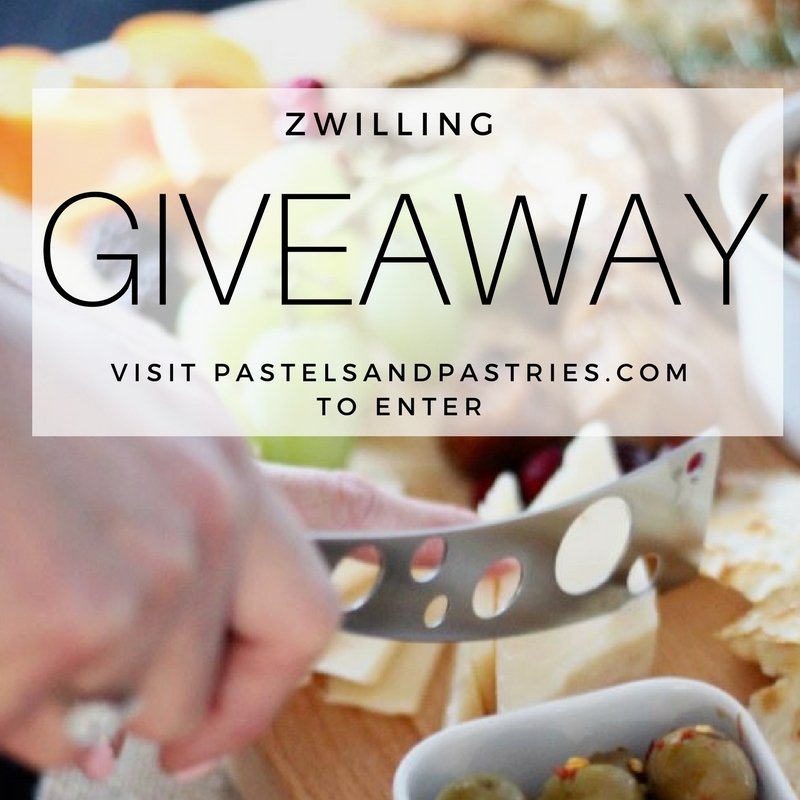 **A huge thank you to Zwilling for sponsoring this post and helping to set up this giveaway. 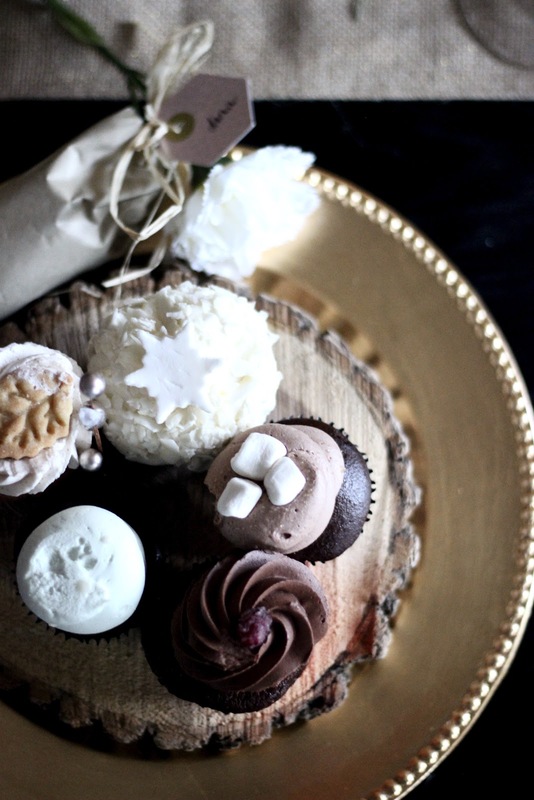 Also, thank you to Kelly's Bake Shoppe and The Fix + Co for helping me with all my entertaining needs! As always all opinions are my own. I love spending quality time with my family! I love hosting family and friends! I love having all the people i care about under one roof... MINE! I love relaxing and seeing other people enjoying themselves! All my children coming home to celebrate. .. I love how people gather, have fun and enjoy good food and conversation! I love having people over and feeding them! Who doesn't love good food and catching up? I just love spending time with family and friends. I love it all! Planning, hosting and especially spending time with family and friends! it is the gathering of friends and family, communing over great food and drink. I like doing all the Christmas baking. I like spending time with friends that we haven't seen enough of through the year. 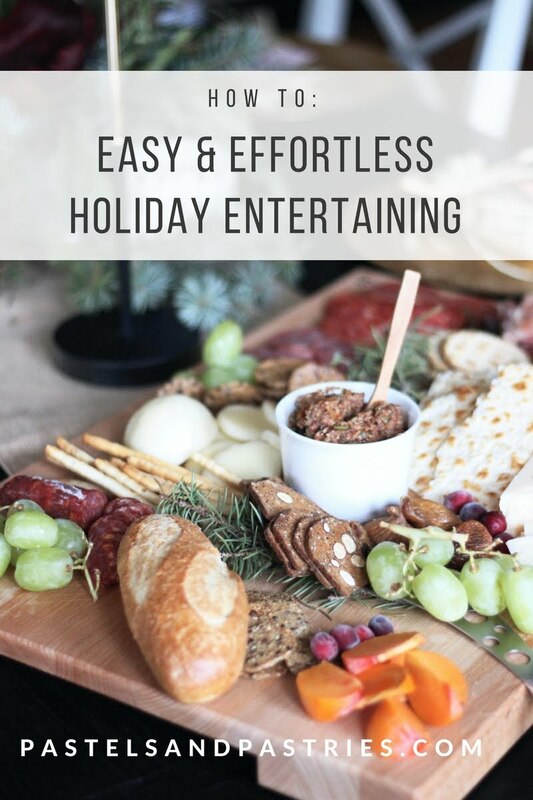 I love to entertain and have my family and friends over for dinner, drinks and festivities! I love entertaining and spending time with friends and family! I love planning and executing a great party! I love seeing friends I have not seen for a long time. I love trying out new recipes! I use mostly tried and true favourites but always include a few new ones! It is nice to spend time with family and friends. love that it brings joy and people together. Connecting family! Love having friends and family over, and cooking for everyone! I enjoy decorating and preparing food for family and friends. I like the laughter and warmth that a gathering of friends brings. So much more informal and fun for host and guests too. Don't make it too formulaic. I love your tips for a stress less get together. The prize is awesome. thanks for the chance. I love getting together with family and friends and having them enjoy what I prepare, it gives me great pleasure! 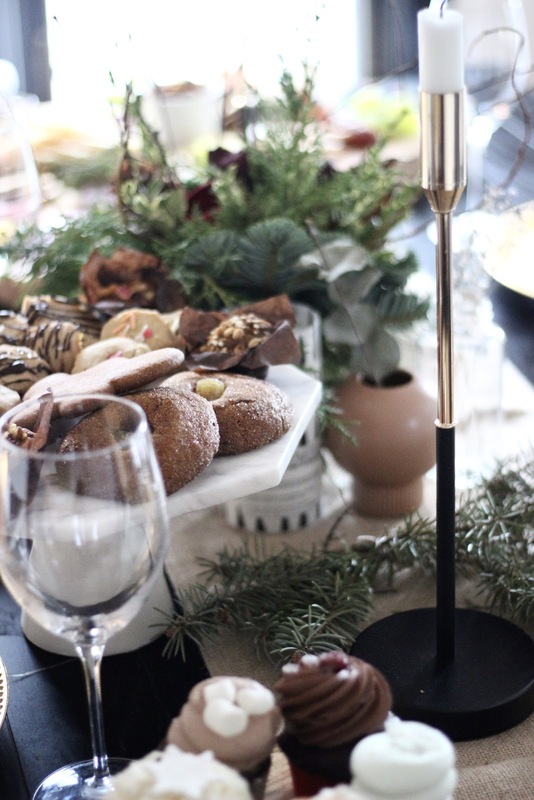 I love decorating for holiday hosting! I love trying new recipes on my guests. Thanks for the chance, I love the tips on new recipes! I love trying new recipes and seeing my guests happy. Thank you and happy holidays. I love seeing friends and family at gatherings, and share food, laughter and memories. You were reading my mind... a platter full of goodness was exactly what I was planning for our festive table. what a beautiful spread you put together!